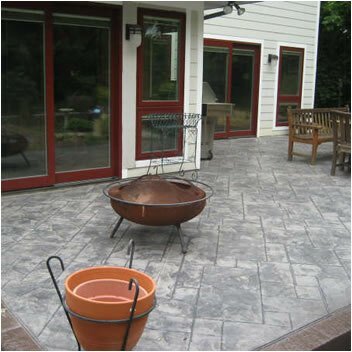 Experienced local company specializing in residential decorative concrete. All jobs are owner supervised from a 2nd generation concrete specialist with 100's of jobs in the metro Detroit area. We have dozens of patterns and 100's of color combinations. Give us a call, we do not sub contract our work or claim to specialize in any outdoor service. We are strictly an experienced CONCRETE only company. Servicing a 20 mile radius around Novi, we enjoy our local neighborhoods. We reinforce all our concrete with 3/8" steel rebar, and fiber mesh reinforcement which is added to the plant to strengthen your concrete. Most contractors and almost all builders never put any type of reinforcement in your concrete. This is why it lifts, cracks, separates. We GUARANTEE ALL OUR CONCRETE WORK for separation and lifting. Copyright 2010 Atlas Concrete Designs. All Rights Reserved.